This last week saw Ajan Bounchanh and Director Jeannette at the first meeting of our 30 students who have registered to take part in LEOT’s Dream Catcher program this year. The group are to meet twice a month. The students are either in their last year of high school or have completed school and looking at what to do next. Many of them were unsuccessful in applying for university places. Some have part-time jobs to help support themselves, as well as save some money for future study. This year the program will focus on Identifying what the students’ dreams are and provide information & activities to learn more about their chosen goals, the pathways to reach them and to determine if they are realistic ones for them. The program will also provide opportunities to visit various other educational centres & businesses, as well as invite speakers to both motivate and provide appropriate information on work and further study options. The program has been broadened this year to include sessions on financial literacy (– budgeting, saving, banking, pitfalls of borrowing money, etc) and job search skills (- job application letters, CV writing, interviews, etc). The Dream Catcher program hopes to work on strengthening the students’ personal development with activities that focus on team building, problem-solving and communication skills. 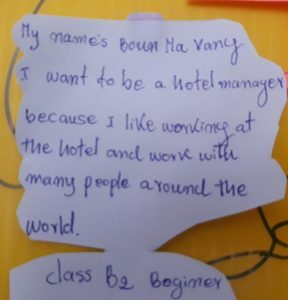 Individual mentoring will also be available throughout the program with Ajan Bounchanh and this will be encouraged when students have personal or financial problems in their lives. We realise that this is a huge challenge ahead of us, made more so because much of the program will need to be translated into Lao, as many of the participants have little English as the moment. We want the students to work hard on improving their skills and knowledge but at the same time, we want them to have fun and enjoy the various activities planned. At the end of the year, we hope that each one of them will have a better understanding of the pathways available for them to reach their chosen dream.